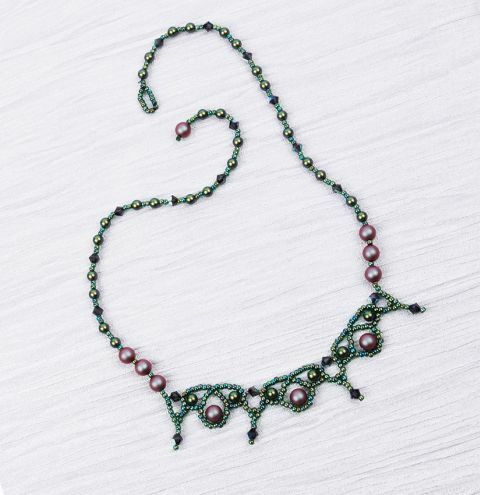 Create your own sparkling Swarovski collar using stunning Scarabaeus Green and Iridescent Red pearls. Cut a long arm span of thread and thread on your needle. Pick up x14 Seed Beads and tie in a loop, then go back through the beads in the loop to reinforce. String the beads that form one side of the necklace. I followed the pattern; x2 Seeds, x1 4mm Pearl, x2 Seeds, x1 4mm Pearl, x2 Seeds, x1 Bicone until x6 Bicones have been added. x2 Seeds, x1 4mm Pearl, x1 Seed, x1 6mm Pearl, x1 Seed, x1 6mm Pearl, x1 Seed, x1 6mm Pearl, x3 Seed. (A) Pick up x7 Seeds, x1 Bicone, x1 Seed, go back through the bicone and the x3 Seeds added before the bicone. (B) Pick up x6 Seeds, x1 Bicone, go through the x5 Seeds before the x4 Seeds before the bottom bicone. (C) Pick up x1 Seed, go through the the x5 Seed beads that are before the top bicone on the right. (D) Pick up x19 Seeds and x1 4mm Pearl, go through the last x5 Seeds added. (E) Pick up x6 Seed Beads, Count x11 Seeds back from the x19 added in the last step and go through the 12th added forming a centre point. Pick up x14 Seeds, x1 6mm Pearl, go back through the last 7. (F) Pick up x2 Seeds, go through the x5 Seeds that are before the point on the right hand side, at the bottom of the 4mm Pearl. Go throught the centre point then the next x9 seeds on the top left hand side. Pick up x1 4mm Pearl, go through the x5 Seeds that sit to left hand side of this bead. (G) Pick up x1 Seed, go through x5 seed beads before the centre point that sit on the top left hand side above the 6mm pearl. Pass through the centre point and the next x9 seeds on the top right hand side, above the first added pearl. (H) Pick x7 Seeds, x1 Bixone, x1 Seed, go back through the bicone and x3 Seeds before the bicone. (I) Pick up x6 Seeds, x1 Bicone, through the x5 Seeds before the x4 Seeds before the bottom bicone. (J) Pick up x1 Seed, go through the x5 Seed beads that are before the top bicone on the right hand side. (K) Repeat Steps D-J until you have x3 complete swirls. Knot off the thread. Cut a new arm span of thread and knot under the seed next to the top bicone. Pick up x2 Seeds, x1 6mm Pearl, x1 Seed, x1 6mm Pearl, x1 Seed, x1 6mm Pearl, x1 Seed. Continue adding beads so that the second side of the necklace matches the first; 1x 4mm Pearl, x2 Seeds, x1 4mm Pearl, x1 Bicone, x2 Seeds until x6 bicones have been added. To Finish pick up x1 4mm Pearl, x2 Seeds, x1 4mm Pearl, x3 Seeds, x1 6mm Pearl, x1 seed, go back through the 6mm Pearl and pull tight. Continue threading back through the beads, knotting as you go. Trim the thread. You are finished. The loop added at the beginning fits over the end 6mm Pearl to fasten the necklace.